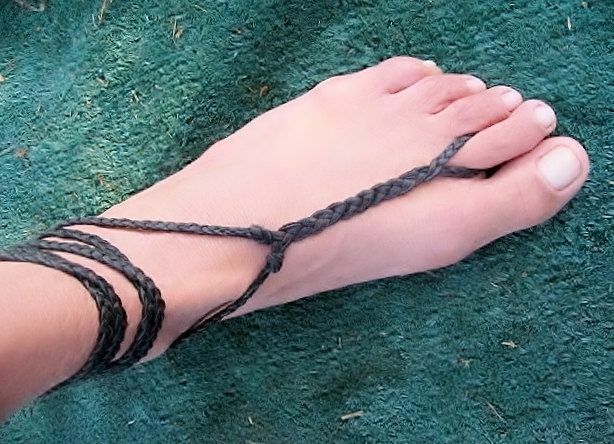 Plain Black Deerskin Hand Braided Barefoot Sandals. Unisex. Dancer Jewelry. Rustic. Artisan. Unisex barefoot sandals. Black deerskin. Hand braided. Dancer jewelry. Slave anklets. Rustic. Artisan jewelry. Made in Maui. This barefoot sandals were made by weaving together three continuous strands of deerskin laces. It gives lasting durability as well as superior comfort.